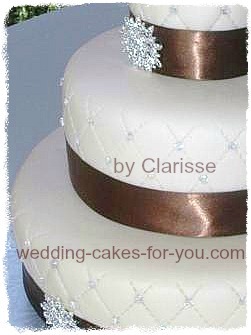 This cake was made for a Bride who loves diamonds. She was asking if there was a such thing as edible diamonds. She had seen some on a cake once and fell in love, but didn't know if they were edible or not. So, I told her there were edible diamonds, and that we could do a cake for her like that. She searched pictures, etc online and came up with a simple cake design. She loved the added rhinestone brooch touches, but couldn't afford the price the vendors were asking for them. So, as a special surprise for her, I got some that I found on etsy and placed them on her cake. This was my 2nd cake, and 1st one for someone I didn't know too well. She loved it. The whole time I was making the cake, I was singing the tune "Diamonds are a girls best friend". he he. Hope you all enjoy seeing it. It makes me want to make Wedding Cakes more...what a special thing to be part of! The cake itself is a Chocolate Chip cake with Cookie Dough Filling. Yay Risse! Good luck. Perfect cake to enter!!! Risse- this cake is amazing, it is beautiful and so obviously made with love! IF I ever get married (again) you will be making the cake!! This cake is beyond beautiful. And it tasted amazing!!! When I get married this girl will be making the cake!!! The cake is beautiful!!! and the diamonds are cool, but the most amazing part is the REAL JEWEL is the one that MADE it!! Risse you are a true Diamond. 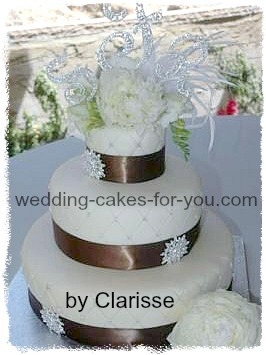 What a gorgeous cake, I love the diamonds and the ribbon, not to mention the flavor, sounds amazing! Hard to believe you have only been doing this for a short time. I can't wait to see what you come up with next! I give you five DIAMOND stars!!! One of the most beautiful cakes I have ever seen! You are wonderfully talented! Excellent job!